The diamond industry is well aware that millennials aren’t as interested or invested in their product as past generations have been—largely because they are very expensive rocks and not, say, food or shelter—so the concept of “loaner rings” has been pushed to the forefront. 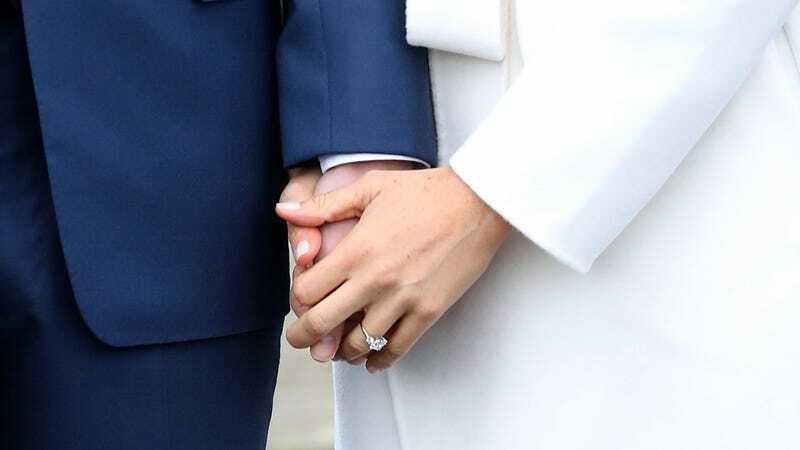 According to a new report from Vox, more couples are opting to propose with stones that aren’t diamonds, or with placeholder engagement rings. In the latter case, jewelers allow consumers to place a deposit in the $50 - $200 range for a cubic zirconia alternative. That way, couples have time to save up for the real deal, or the ring-wearer has time to make a decision on an ideal style. That’s well and good, but why not forgo the ring entirely? There’s no law that stipulates proposals must be conducted with a ring in hand, so why do it? Unless one party has an inherited vintage ring in a gorgeous Art Deco setting that will cost approximately $0 and some mother’s happy tears, what’s the use? Or if you are going the cubic zirconia route, why not wear that one forevermore? In 2018, Helzberg Diamonds released the “Will You?” ring, a $50 silver band engraved with the phrase, “This is a ring, not the ring.” Purchasing the placeholder guarantees the consumer a few hundred dollars off a diamond engagement ring, whenever he or she is ready to take the plunge (into debt!) and allows the couple to make the decision together. For those traditional partners, I’m sure that seems like dream scenario. But for the rest of us, there are cheaper options—I used to purchase really expensive-looking fake diamond rings from Sears for like, $20. Those mall retailers are shuttering many of the stores in the shadow of these United States of Amazon, so perhaps they’re even more affordable now. Or, you know, just don’t buy anything at all.